Please post you bugs & crashes in this thread. Soem users ahve reported some problems exporting certain workouts in FIT format. It is under investigation what exactly is the problem but it doesn't occur with all workouts. My guess it that a certain step target or duration creates some problems. Upon investigation, this problem seems to be with the device's firmware. Some workout that fail for one user work for another and vice-versa. At the moment, the workaround is to export your workouts to a FIT file directly in the Garmin\Workouts folder on your device. Alternatively, if you can export to TCX in the Garmin\NewFiles folder, it should also work but the TCX format doesn't support all of the new Edge features so it might not be an option. This should work without problems and I am contacting Garmin with regards to this issue that I beleive is in their firmware 2.4 and possibly others. The latest Communicator plugin with older devices (FR305) seems to have a problem importing from device. For some reason it tells me that you device suppoort mass-storage mode which it doesn't. So I'm trying to read the files directly from the device which is not supported... Amazing work from Garmin!!! So, there's an easy fix on my side. Since I don't use the mass storage mode I can easily disable the code related to this. I'll do so when I get home and I'll psot a new version ASAP. PissedOffCil wrote: The latest Communicator plugin with older devices (FR305) seems to have a problem importing from device. This is fixed in version 1.1.364. The problem was that Edge 500 & 800 don't support mutliple activity profiles like other devices. Since they only support Cycling all FIT workouts will be exported as Cycling workouts. Hopefully they will fix this in the future. PissedOffCil wrote: Upon investigation, this problem seems to be with the device's firmware. Some workout that fail for one user work for another and vice-versa. I have ver. 1.1.366 installed on ST 3.0, try to export a workout to my Edge 705 (firmware 3.20), ST 3.0 crashes. I woud attach the workout here, but I don't see the way to put attachments. If you want I can send it directly to you. Did it work in the past with 1.1.366? If yes, then try to remove some workouts from your device before exporting. Sometimes stuff gets corrupted and then the Communicator plugin crashes without warning. It could also be your profile that's corrupted but that's rare. I can assure you Export to file works as I use it almost every day. You can use that in the mean time if everything else fails. PissedOffCil wrote: Did it work in the past with 1.1.366? Did not try with previous versions of the plugin, I am starting to use it now to prepare workouts for the next season. I don't have workouts in my Edge (removed all) except the one I have created with the plugin and Export to file. Export to file works nicely. I have tried Export to device with a smaller workout, ST3 crashed again. I don't know if there is any error log I could lokk at to give you more information about the issue. For the time being I will contibue to Export to file, no problems. rikicarra wrote: Did not try with previous versions of the plugin, I am starting to use it now to prepare workouts for the next season. I had 2.9.3.0 installed and properly running, tested and works fine (my Edge is recognized). Tried again today to Export to device and crashed. As I said, it's not a big problem to me, I Export to file and then copy the files on the Edge memory, I just wanted to make you aware of the issue. If there is anything I can do to test, let me know. So the communicator plugin works from WITHIN SportTracks? Does import from device work? Did you try with the profile? Do you get the same crash? Any chance of a screenshot of the crash or copy/paste of the error message? PissedOffCil wrote: So the communicator plugin works from WITHIN SportTracks? Communicator plugin works from whitin ST3. Import gets to the same crash. From profile, import and export works, no error at all. I am attaching the "error message", as my intallation is in Italian the error is in Italian, basically W7 message is "SportTracks stopped working. Windows is serching for a solution to the problem"
Ok..... Not much info in there. I have your e-mail at home I'll send you a debug version tonight. I was finally able to reproduce the problem. It seems to happen when exporting workouts with power targets to device. I'm pretty sure I had tested this with the beta version of the Communicator plugin 2.9.3 so I'm checking it out with Garmin, trying to figure out what changed. The best workaround in the mean time is to export to file, as usual. I created a workout in which the first 8 miles are run with no target, and then the remainder of the run is (8 x 1 mile) with a target of 8:30 - 8:35 per mile. When the workout is exported to my FR305, the pace goal for the (8x1 mile) is changed to 6.99 - 7:00 per mile. This is a follow-up to my bug report of 12/14/10: at the start of this morning's run, I realized that the pace goals (6.99-7) that were exported to the FR305 were not paces (minutes/mile), but speeds (mile/hr). The 6.99 corresponds to the 8:35 pace, but 7 is an 8:34 pace, and should be 7.06 for an 8:30 pace. For this morning's run, I exported a workout withut any pace goals, just a repeat of 22x1 mile. To my surprise, when I started the workout, I noticed that my run speeds were being displayed as miles/hr, not minutes/mile. I don't know if this is a problem related only to exports to the FR305, but I don't plan to use the Garmin Fitness plugin any more until these bugs are corrected. I am a runner, not a cyclist, and I want to have the workouts I create express speeds in terms of run pace. Sorry for my late answer, I was on vacation last week. I'm glad you found your problem with regards to pace change. As for the speed vs. pace, my guess is that you are exporting your workouts not as a running workout but rather as a "Other" workout. Did you make sure to setup your ST -> Garmin categories associations? Thanks for the link to the wiki and for pointing me in the right direction. Before I posted the bug reports, I went through GF setup several times looking for some setting that said to use running settings, not cycling. I noticed that the category settings were all defaulting to the "Other" custom category, but everything was "grayed out", and I couldn't make any changes. That "Other" selection explains why my paces were all getting exported as speeds, not as paces. All is well now, I have gone through setup again, and this time when I selected the "Running" category, I found that the radio buttons were active, and I was able to make the right selections. Following this, I exported the same workout with the 8:30 - 8:35 pace goals to my FR305, and now the paces are correct on the 305. Sorry for the false alarm/inattentive user error! Thanks again for your help! If the options we're greyed out, it's probably because you didn't select a category. I'll have a look to see if there's a problem there when I get a chance. thank you for the Plugin! I have also problems loading profile updates to my device: Forerunner 310xt. As with the Forerunner I am not able to load data directly to any internal memory, the workaround does not work for me. Looks like ANT-agent does not recognize any action to do. Import to ST3 for standard workouts is running well. What do you mean by "profile updates"? You can't export to device or import from device? Or both? I'm not sure the 310xt supports importing profile as the 405 doesn't and they both use the ANT agent. However, you should get a proper message saying so. 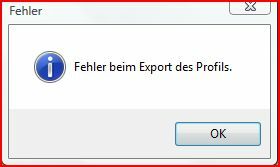 ... What in english means something like "Error while export of profile." No Error message, but nothing changed on the Forerunner. In both cases, the ANT-agent didn't show, that a connection is established. Also the Forerunner did not show a connection. 3. Send a "Training" to the device-> Result was the same than in the first step telling me "Error while export of training"
in general, it seems, that your plugin is not connected to ANT-agent properly. Do you have an Idea? It is working well with Training Center and Germin Connect and ST3 Import for workout files. First of all, you have things inverted. "Export" sends data from the plugin to the device. "Import" gets data from the device to the plugin. 1) I have added better error handling in the plugin. We should get more info in the next version to help me debug. I'll release this soon, many fixes have been added. Often when these error occurs, it's due to a corrupt workout or profile on the device. Try emptying your temporary ANT folder and retry. 4) This is the error message when your device doesn't support a feature. This is the expected result, your device doesn't support importing workouts. You could always import from file from the temporary ANT folder. Also, there have been some problems with ANT agent devices in the past but this has been fixed. Make sure you update to the lastest version.